Many of our Sakada Offsprings have served in the United States Military. One in particular is Gregory Torricer Peros. He was born in Santo Domingo, Ilocos Sur, Philippines on November 14, 1944. His parents are the late Silvestre Peros, Sr. and Herminia Torricer Peros. Greg is married to Petra Domingo Peros, a retired Housing Specialist at the County of Maui. Greg and Petra have three successful children: Gregory Patrick “Jay” Peros, Peggy G. Peros Andes, and Pamela Peros-Henderson. Gregory Patrick “Jay” Peros graduated from St. Anthony High School and Southern Oregon University with a Bachelor in Business Administration/Marketing. He is presently the General Manager of Maui Beach Hotel. He is married to Lorelle Solanso Peros. They have two sons, Jeremy and Jarred. They live in Kahului, Maui. Peggy G. Peros Andes graduated from St. Anthony High School, the University of Portland with a Bachelor in Business Administration/Accounting and from Chaminade University with a Masters in Business Administration. She is presently employed as a Physician Recruiter for Hawai‘i Pacific Health/Straub Medical Center. She is married to Paul Andes. They have a son, Paxton. They live in Waipahu, O‘ahu. Pamela Peros-Henderson, LCSW (Licensed Clinical Social Worker), graduated from St. Anthony High School, the University of Portland with a Bachelor of Arts in Psychology and a minor in Political Science, the University of Hawai‘i with a Masters of Social Work and Benedictine University (Lisle, Illinois) with a Master of Science in Business Organizational Behavior and a Master of Science in Management and Organizational Behavior. She is employed at Georgia Outreach and as an Individual and Family Therapist. She is married to Corey Henderson. They have two sons, Cole and Cameron. They live in Richmond Hill, Georgia. Greg’s father, Silvestre Peros, Sr. was one of the thousands of Sakadas who came to Hawai‘i from the Philippines to work in the sugarcane and pineapple plantations. He worked as a fertilizer maintenance man and an irrigation man at HC&S until his retirement in 1978. His family was one of the few families who were able to come to Hawai‘i in the same year, 1946. So the whole Peros family including his wife, Herminia, daughters, Aurea, and Nenita, and son Greg migrated to Hawai‘i. They settled in Camp 13. Their son James was born on Maui in 1947 at the Pu‘unēnē Hospital. To support a big family at that time was difficult for the Peros family. So in 1950, Silvestre, Sr. and Herminia decided to take their family back to the Philippines in Santo Domingo. At the same time, Herminia was pregnant and ready to give birth to another child. They were afraid she was going to give birth on the ship while returning to the Philippines. But in God’s time, their baby boy, Sylvester, Jr. was born as soon as they reached Santo Domingo on January 3, 1951. 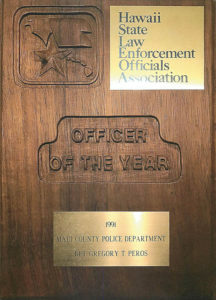 Plaque given to Greg as Officer Of The Year in 1991. Later that same year in 1951, Silvestre, Sr. returned to Hawai‘i to work. The Peros children began their school years. Greg attended elementary school in Santo Domingo. He attended Ilocos Sur High School in Vigan until he was a Junior. In 1960, the family moved back to Hawai‘i except Aurea who was already married. However, she was able to re-join the family several years later. Greg enrolled at Baldwin High School. He graduated in 1963 then attended Honolulu Business College on O‘ahu, majoring in accounting in 1965. Right after graduation, he was drafted into the United States Army. However, after talking to an Army Recruiter, Greg decided to volunteer and served for three years. 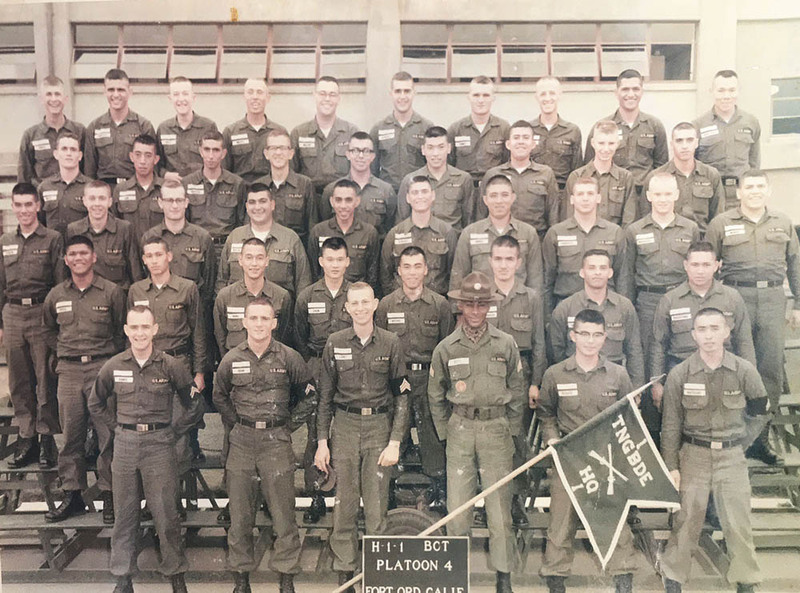 Greg did his basic training at Fort Ord, California. After his basic training in January 1966, he went to school at the United States Army Finance School in Fort Benjamin Harrison, in Indianapolis, Indiana. In 1966, he was assigned to Fort Benning, Georgia where he was stationed until January 1968. He was then sent to Germany and assigned to Southern European Task Force in Vicenzia, Italy. In October 1968, he returned to the United States, at Fort Hamilton in New York where he was honorably discharged. Upon returning home from the military, his first civilian job was a Bank Teller at the then American Security Bank, Wailuku Branch. He later worked as a Sales/Clerk at a Furniture Store. He also worked at the County of Maui Immigrant Services Division and County Finance Department. While working at those various jobs, Greg got involved in the Filipino Community and met the leaders in the Community such as the late Nancy Andres, Aggie Cabebe, Leo Agcolicol, Atty. Antonio Ramil, the late Cirilo Sinfuego, and many others. This was the time when the planning of the first Barrio Fiesta began and he was very happy to be asked to be a part of the Filipino Fiesta Steering Committee. That was almost 50 years ago and the Barrio Fiesta will be celebrating its 50th Anniversary next year, May 2019. Since then, Greg has been very active in the community and held offices not only locally but statewide. He is a past president of the United Filipino Council of Hawai‘i, a past president of the Maui Filipino Community Council, a past president of the Lāna‘i Community Association, and a past Vice President of the Maui Filipino Chamber of Commerce. He is the current president of the Santo Domingo Association of Maui. Greg is not only very active in the community but is also active in the church, specifically, Christ The King Catholic Church in Kahului. At Christ The King, he is a past Pastoral Council Chairperson, Lector, Extraordinary Minister, Outreach Networking Ministry, and a Grand Knight of the Knights of Columbus Ministry. When Greg was working in the County Immigrant Services Division, he was asked numerous times by police personnel to assist in felony case investigations as an Ilokano interpreter. Each time Greg assisted with interpreter services, he would be asked to join the police force. After a year or so of assisting as an Ilokano interpreter, Greg finally became interested in doing police work. He applied for a police officer position and after he passed the required examination, he was hired. Greg started Police Recruit Training in April 1976 with 12 other men. One of his fellow recruits was an Air Force veteran. He mentioned to Greg about the Veteran GI Bill and classes at the then Maui Community College. Greg followed the advice and using the GI Bill, enrolled at the college taking evening classes and majoring in Criminal Justice. After about eight years, Greg completed the required credits to graduate and received his Associates Degree in Criminal Justice. In 1978, Greg was assigned to serve on Lāna‘i for one year. He and his wife, Petra decided that the whole family should move to Lāna‘i for the whole year. They rented their house on Maui and they lived in one of the houses designated for police officers on Lāna‘i. The whole family got involved in the Lāna‘i Community. 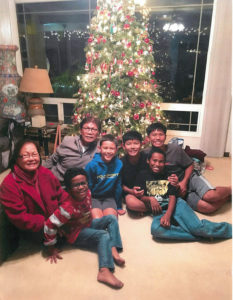 His son, Jay became a member of the Lāna‘i Youth Baseball League and other community affairs. So Greg decided to extend his assignment there on Lāna‘i. Lāna‘i has a very large Filipino population and so they joined the Filipino Association and Greg even became their association’s president soon after joining. 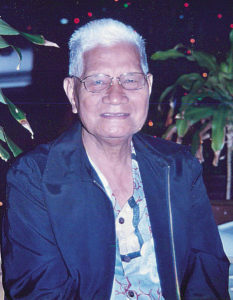 During his term as President of the Lāna‘i Filipino Association, with the four Filipino groups—Ilocos Norte, Ilocos Sur, Pangasinan, and Visayan—they were able to work together and organized a mini Barrio Fiesta using bamboo to build Bahay Kubos, very similar to Maui’s Barrio Fiesta. The family also enjoyed fishing and hunting with their friends while they were on Lāna‘i. Greg’s Children. Left to right: Peggy Andes, Gregory “Jay” Peros, and Pamela Peros-Henderson. However, in 1984, Greg and his family decided to move back to Maui. After three months of being back on Maui, he got promoted to Sergeant and Greg was assigned to go to Molokai. He and his wife decided Greg would go to Molokai for the one year assignment and Petra would stay home with their children. 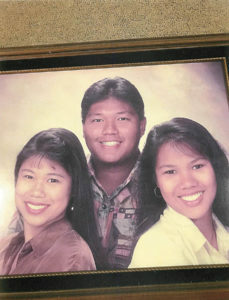 At that time, their son Jay was attending St. Anthony High School and their two daughters, Peggy and Pamela were attending Kahului Elementary School. Greg came home almost every week on his days off to be with his family. After eleven months on Molokai, Greg came home using the 12th month as his vacation. Greg worked in the Wailuku Patrol for a few years, then in 1988, he requested to be transferred to the Criminal Investigation Division. He served about three years as a Detective. 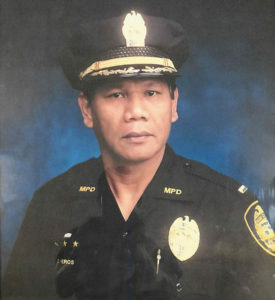 In 1991, the Hawai‘i State Law Enforcement Officials awarded Greg “Officer of the Year,” Maui County Police Department. Greg and Petra went to Hilo where he received his award during their convention. Greg was promoted to Lieutenant several years later. He retired in 1999. As a retiree from the Police Department, he is still very active and trying to give back to the community and church. He is still working as a Registered Court Interpreter, a Realtor with Peros Realty Company and a businessman as President of GPP Imports Inc., which imports Philippine products. Lucy Peros is a retired school teacher, having taught for 32 years, 11 years at St. Anthony Grade School and 21 years at Waihe‘e Elementary School. Both of her parents, Elpidio and Alejandra Cabalo of Hāli‘imaile, worked for Maui Land and Pine Company. Her dad was a 1946 Sakada. Lucy is currently a Realtor Associate at Peros Realty, the business her late husband Sylvester Peros, Jr. started 30 years ago, where her daughter Lianne Peros-Busch is now the Broker. 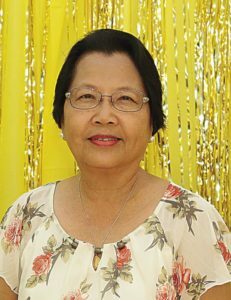 Lucy devotes a significant amount of time to activities at Christ The King Catholic Church as well as babysitting her grandchildren.